On Wednesday night, Brooklyn Community Board 1 voted 18 to 8 against a DOT plan to add a bike lane connecting Bushwick and Ridgewood via the Metropolitan Avenue Bridge. Technically, the board voted against making a recommendation on the project, but after two years of deliberation already, the decision to withhold an endorsement is tantamount to opposition. The Metropolitan Avenue Bridge is an important connection between the Williamsburg Bridge and points east, used by hundreds of cyclists each day. It’s also treacherous: Two cyclists were killed on the bridge between 2009 and 2013, according to DOT. More than half of peak-hour drivers on the bridge travel above the speed limit. DOT’s plan would remove one westbound car lane to make room for painted bike lanes. It has been in the works since 2012. Under the plan, the buffered eastbound bike lane would extend all the way to Onderdonk Avenue, while the westbound lane would give way to sharrows on the bridge [PDF]. Despite the years of back-and-forth on the minute details of the project, the board continues to withhold its support. In an unsigned email statement to Streetsblog, CB 1 said DOT’s project “failed to address” the “extremely dangerous” left turn from westbound Metropolitan Avenue onto Varick Avenue, just east of the bridge. The motion to table the project was made by transportation chair Vincent Gangone during his committee report, according to board member Ryan Kuonen, who said board members in favor the project were “very upset” by the move. DOT first presented the plan to CB 1’s transportation committee in June 2014. The agency returned to CB 1 about a year later, after collecting feedback from local businesses, and was told to present the plan again in the fall. At June’s full board meeting and again at a transportation committee meeting earlier this month, DOT presented an updated version of the proposal. One traffic injury occurred at the intersection with Varick Avenue in 2015, fewer than at all but one of the other intersections in the project area. District Manager Gerald Esposito raised concerns about the left turn there at DOT’s presentation to the transportation committee earlier this month, suggesting that it be modified or eliminated, but he and the board members present were otherwise positive about the proposal. DOT can proceed with the project without the board’s endorsement if it chooses. Council Member Antonio Reynoso, who represents the area, has previously cited this project as an example of the limitations of the city’s community board process, arguing that CB 1 should give input, but not have veto power on street safety projects. 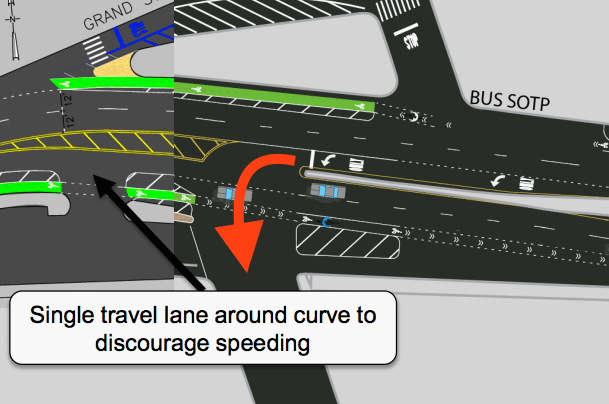 What does the left turn have to do with the bike lane proposal? This left turn exists in this same form today without the bike lane. Just build it. 2 years of obstructionism over such a small project that barely changes the street geometry represents an insane amount of overhead costs. As for the design itself, the buffer on the inside of that curve is going to get worn away without any physical protection, just like the curve where Kent Ave becomes Franklin. Why are they turning down $50 million in safe streets funding from the City Council and then painting projects like this without any physical protection? Tell deBlasion that the project facilitates double parking and it will be finished by Tuesday evening. Again, compare the level of “public review” for this improvement, or the Park Slope Citibike stations, with the 10-lane Staten Island Expressway, which was only publicly discussed as a bus lane addition and described in documents as that plus “auxiliary lanes” in a small segment. yep, around curves, bike lanes without protection are car lanes. Also, everywhere. Fortunately the bikes are protected from oncoming bike traffic. Their need to support their inflated sense of self importance and imagined traffic engineering expertise is where this comes from. They don’t get the sense of urgency to make this road safer NOW! They could demand flexible bollards be installed to enforce separation of the bike lane, and still feel they’ve made a contribution. That would be nice. Here – I fixed it for you CB1. Now you can go ahead and make recommendations on a design which will actually keep people safe. Alternatively, you can vote against a design which will keep people safe and we can all start to be honest with each other. You guys both missed the big silly “BUS SOTP” typo in the top right! This is why CB1 won’t take us seriously! Oh, I caught it. I left it as a perfect snapshot of prioritization of transit.